1 Windsor Holden Famous Sayings, Quotes and Quotation. The pigeon had been unlucky. 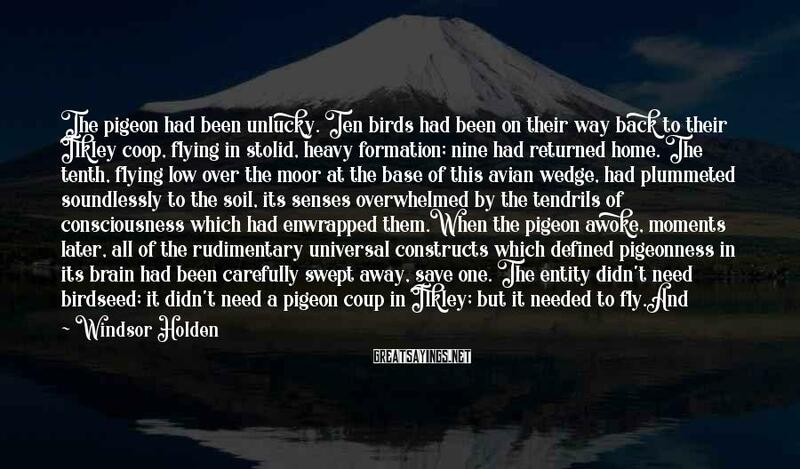 Ten birds had been on their way back to their Ilkley coop, flying in stolid, heavy formation; nine had returned home. The tenth, flying low over the moor at the base of this avian wedge, had plummeted soundlessly to the soil, its senses overwhelmed by the tendrils of consciousness which had enwrapped them. When the pigeon awoke, moments later, all of the rudimentary universal constructs which defined pigeonness in its brain had been carefully swept away, save one. The entity didn't need birdseed; it didn't need a pigeon coup in Ilkley; but it needed to fly. And it needed as much of the pigeon's cerebral activity as possible to focus on getting it to its desired location, which meant that for the first time in its life, this pigeon was reading roadsigns. It was also experiencing emotions for which it was somewhat unprepared, most notably an insistent, imperative yearning for Leeds United.